Over the last few weeks is I have been unable to work down in the studio on my larger work because of a sick dog. The only good things about this is that I have had time to work on some of the small pieces that I can do in the house. Stained Indiana Limestone Sculpture - "Born from the Broken"
Since February last year, I spent the vast majority of my time on a large public commission for Norton Hospital. The sculpture was too large and complex to have time to work on anything other than this one piece. I had other commissioned work, but could never feel confident to get to that, much less the myriad of ideas I have in my head just waiting to find their way into a piece of stone. That commission installed in April. Once complete, I immediately began work on the two larger pieces that have been delayed. I started carving a fountain that is a commissions well as an abstract piece for a show later this summer. While it was great to start in on some fresh ideas and pieces, I still had some small work that I had started prior to starting the Norton commission, as well as the many ideas that are just waiting to burst out of my head. I really thought that after the Norton sculpture was completed I would have time for both the larger work and the smaller pieces. It just hasn't happened. So, two weeks ago one of our dogs got sick. Because of the nature of the illness, she needed constant supervision. That meant that I couldnt work in the studio. While that has put some stress on finishing the larger work, it has provided the room in the schedule to complete a few of the smaller pieces that I has already started as well as get some ideas out of my head. The untitled tortoise shell alabaster piece that is pictured here is one of the pieces I started over a year ago. Because of the difficulty of the stone to carve, I had set it aside in favor of other pieces several times. That piece is now complete. Not only did I have the two (and many others) that I started and have been unable to get back to, I also have been looking at so many of the pieces of stone in my studio that I have not been able to start. That has now changed. I have started and completed two other small pieces. The first was a piece that actually broke off of the large figure from my Norton commission. When it broke off, I was devastated. Several times I started to throw the piece out because it disgusted me. For some reason I never did. I am glad I did not, as I feel it turned out into a pretty nice piece. I also started and finished a piece of Bordiglio Marble. This is a piece of marble that has been split off of a 3/4 life-size figure I am in progress on. It was a thin piece and I thought I saw something else in it, but it changed its mind and we ended up with the nice little piece that is on the double poles. So, the good news is that my dog is on the mend and next week I will be able to get back into the studio. But what it taught me is that I still need to take a bit of time to work on the small pieces that have provided such a great sense of accomplishment this past two weeks. Over the past two months I have been frantically working on getting ideas out of my head and into stone. I have so many ideas that I was not able to get to while working on my Norton Hospital commission. I also had several ideas started before the commission and hadn't been able to get back to them to finish them. So finally, I have completed my first gallery small sculpture in months. This piece is untitled as yet, although I have had the suggestion that it looks like a sting ray. That sounds interesting, so that may end up as the title. Even though the title is not complete, the rest of the piece is. This was one of the pieces I started before the Norton commission. It was a very difficult stone to carve. All of the veining created some fragility. I spent a lot of time changing direction and pressure to keep pieces from breaking off. There is also a big difference in the density throughout the stone. I would be carving along on one of the harder areas and all of the sudden the grinder would dig in. It was tough to control the pace of the tools. All that bings said, those difficulties are caused by things that create such a beautiful stone! So, as soon as I finished this piece, I ordered some more pieces! 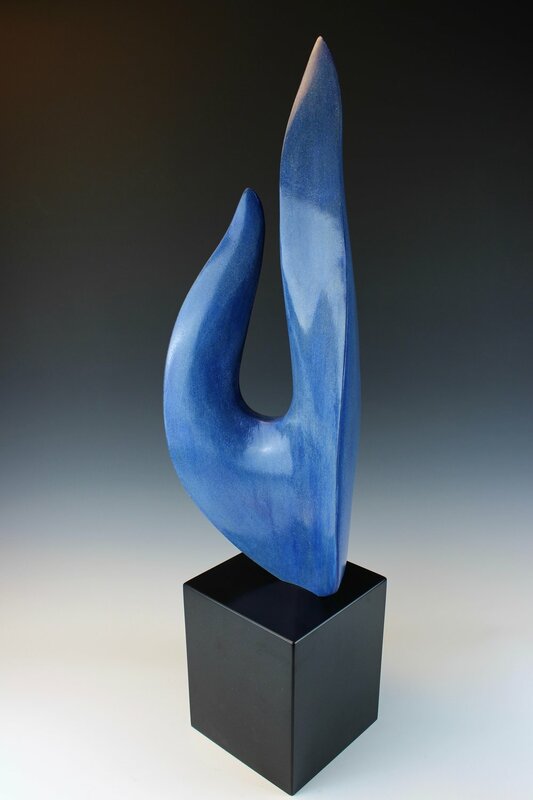 "Dance" is my latest sculpture. It was carved from Indiana Limestone. This is one of the best stones to carve for outdoor sculpture. It a soft stone that will hold an edge very well. This time-lapse video covers 7 days of carving. This video is a time-lapse video of the making of "Dance", a contemporary sculpture carved from Indiana Limestone by Mike McCarthy. This 2:30 video covers 7 days of carving.